Cordyceps Nu V is produced by a Singapore company, AP Nutripharm. AP Nutripharm was created in 2002 and is a fermentation and biotech company based out of Singapore. They’ve manufactured several products including healthy medicinal fungi, animal nutritional, and lifestyle medicines. One of their products is their high grade Cordyceps extract. 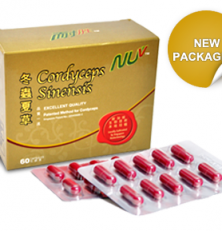 AP Nutripharm’s Nu V Cordyceps come with 60 capsules. The mg of Cordyceps is not listed. Click here to find out more about cordyceps history in general. The polysaccharides percentage in this product is 25.0% and as such, seen as one of the highly effective products in the market. However before purchasing this product I would confirm with the seller how many milligrams of Cordyceps Sinensis each capsule contains. The price seems reasonable considering the percentage of polysaccharides but again depending on the weight of each capsule. If the amount of Cordyceps extract is less than 400mg I would consider the price quite expensive. As was mentioned early, the higher the polysaccharides concentration the better the product gets absorbed by the body and the better polysaccharides can interact with our immune system. In addition, a high polysaccharides concentration means higher concentration of nutritional elements, such as vitamins, amino acids, minerals, essential fatty acids, enzymes, polysaccharides and other active chemical elements. With AP Nutripharm’s Cordyceps product, they do not come with a money back guarantee. But with that said they have consistent positive product reviews and have not received many complaints. AP Nutripharm ships to all over the world for a low cost. Shipping costs vary but generally cost about 5-15$. AP Nutripharm uses FTIR spectroscopy in their analysis. We have to be careful here as most companies use HPLC analysis. The two differing techniques will provide different analysis results. Normally FTIR will show somewhat higher analysis than HPLC, even double. This product is also the dried powder of fermented mycelia, thus a basic powder and not an extract in the true sense. Basic mycelia powders like this one need to be extracted to fully crack the cell walls to release the most important nonlinear polysaccharides. Nice article its very helpful for me thanks for sharing.